Over the period of about 3.2-2.7 Gya, rocks on the surface came together to form the first cratons, which would become the central cores of continental plates. Sediments from the eon, which indicate that the rock cycle (volcanism-sedimentation-metamorphism) was in action, provide evidence for the existence of continents and oceans. The oldest existing continental rocks date from the Archean at about 4 Gya. [ref]Spooner, 255. [/ref] By the end of the Archean, plate tectonics was under way. Solar energy received at the surface of the Earth was about 20 to 25 % lower than present, which could have made the planet too cold for life to be established[ref]“Climate puzzle over origins of life on Earth”, http://www.manchester.ac.uk/discover/news/article/?id=10798. [/ref], but the CO2 retained heat beneath the atmospheric layer, causing a greenhouse effect which slowly raised atmospheric temperatures. Sunlight striking the water vapor caused photochemical dissociation, the breaking up of the water molecules and the bonding together of the resulting oxygen atoms to create ozone, or O3. In time, the ozone came to protect the surface of the Earth from ultraviolet radiation from the sun. At the same time, it prevented further chemical dissociation, which therefore has not played an important role in the oxygenation of the atmosphere. Further increase of atmospheric oxygen had to wait for photosynthesis, as described below. Arguments over what was the earliest form of life (and who discovered it) probably are not over yet. Currently, the oldest fossils would be of bacteria from Australia, dating from 3.4 Gya. [ref]Microfossils of sulphur-metabolizing cells in 3.4-billion-year-old rocks of Western Australia, Nature Geoscience https://www.nature.com/articles/ngeo1238. [/ref] What makes them interesting is the fact that their metabolism was based on sulfur rather than oxygen, which was not yet common in the atmosphere. 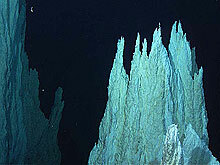 The second hydrothermal-vent model proposes that life originated in alkaline hydrothermal vents. In places on the ocean floor, peridotite rock, which is normally found deep in the Earth’s mantle, has been pushed up to the surface by faulting. The rock contains olivine, which reacts with sea water to form the minerals serpentine and magnetite; the process is called serpentinization, The reactions are exothermic and increase the volume of the reactants. The heat is generated by chemistry and does not come from hot magma, as is the case with “black smokers”. The result is an alkaline solution (pH = 9-11) rich in calcium and H2. The rocks produced have lower density and so expand and push up. They crack and more sea water moves in to react with remaining olivine. 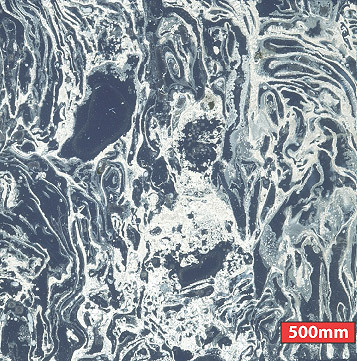 On contact with colder sea water, the calcium precipitates out, forming white structures like chimneys. [ref]These results are for the Lost City Hydrothermal vents. Results differ some for other vents. [/ref] Eventually, small cracks and “cells” form within the rock. Rising fluids are very alkaline (basic) and thereby precipitate out calcium carbonate and other alkaline substances when they hit the cold sea water. These then build up on the pile of rock already started and soon “reverse stalactites” are produced by the carbonate left behind by the thermally rising water. Iron in the olivine is oxidized, leading to production of reducing gases hydrogen, methane and hydrogen sulfide. [ref]“The Lost City 2005 expedition”, NOAA, http://oceanexplorer.noaa.gov/explorations/05lostcity/background/serp/serpentinization.html. [/ref] These gases in turn are a source of energy. So the rising “chimneys”, which may reach many meters in height, are associated with a source of energy, gases like those in the “primordial soup” and small cell-sized alveoli or compartments. Such an environment may well be suited to abiotic hydrocarbon production. [ref]https://www.researchgate.net/profile/Marvin_Lilley/publication/5613067_Abiogenic_hydrocarbon_production_at_lost_city_hydrothermal_field/links/0c960520e90a17f539000000.pdf[/ref] The compartments contain and protect their contents as well as ensuring their concentration, making excellent conditions for the production of inorganic precursors to organic life. 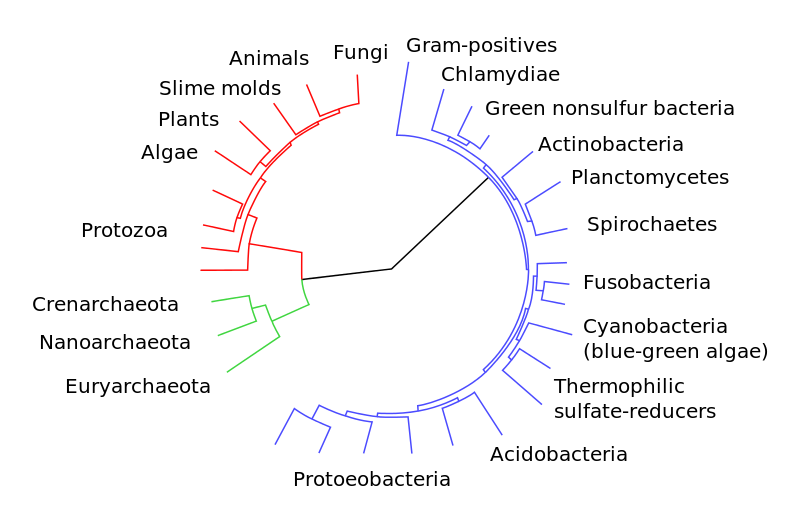 From these, prokaryotes and archea could have evolved independently around 3.8 Gya and eukaryotes later, around 2 Gya. Cyanobacteria have been called the “working-class heroes of the Precambrian Earth”[ref]Knoll (2003), 42[/ref] and were fundamental to the development of life. The importance of these organisms cannot be stressed too much, as they were the first organisms to carry out photosynthesis, the use of energy from the sun to convert carbon dioxide into nutrients and free oxygen, which is returned to the atmosphere. 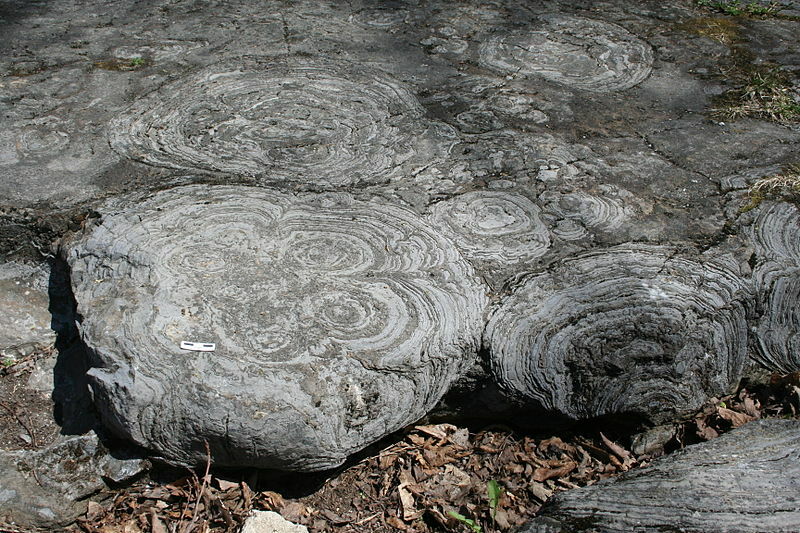 Over hundreds of millions of years during the Archean and Proterozoic Eons, as cyanobacteria used photosynthesis to recover the energy necessary for their own metabolism, they brought about the gradual transformation of atmospheric CO2 into the oxygen necessary for other forms of life[ref]The capability of stromatolites to accomplish this task alone has been questioned and other mechanisms suggested. [/ref], such as ourselves. At the same time, the greenhouse effect was reduced and, thereby, global temperatures. Much CO2 was also dissolved in the seas, where it combined with calcium to form calcium carbonate, which in turn solidified to form limestone. 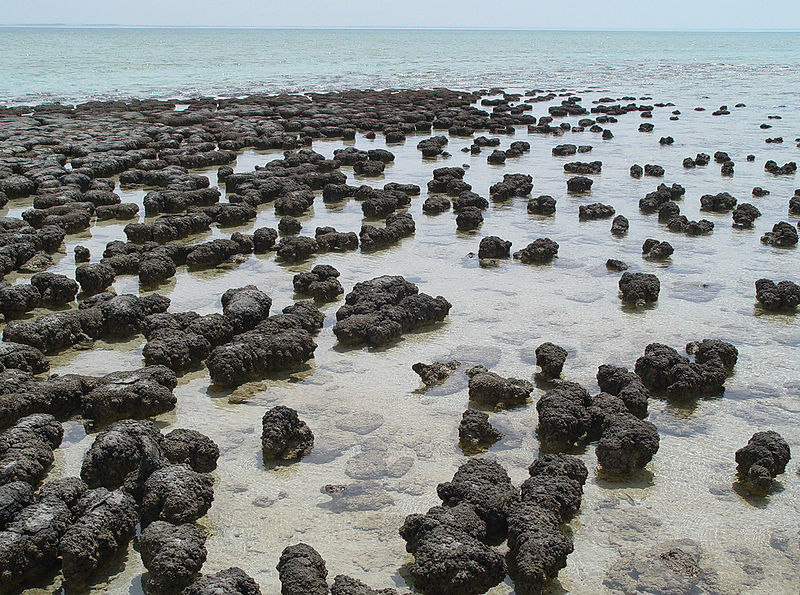 Limestone, ocean water and corals are huge stores of carbon dioxide (carbon sequestration). 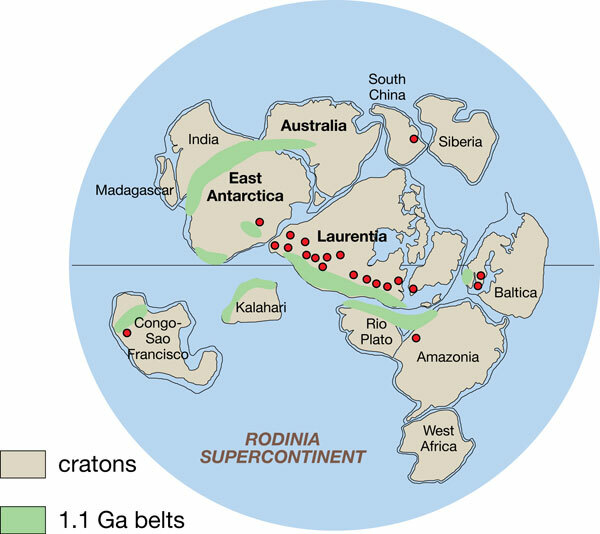 By about 1.8 Gya, all these cratons had collided and coalesced to form the supercontinent Columbia[ref]Also called Nena, Nuna or Hudsonland.[/ref]. Since it was situated on the equator, its interior was hot and dry. There were therefore no or few ice caps and ocean levels were relatively high. With the atmosphere richer in oxygen, other forms of life evolved. More complex cells called eukaryotes appeared about 1.4 Gya. Such cells incorporate smaller components called organelles. Examples are the cell nucleus and the mitochondria[ref]Singular, mitochondrion. [/ref] essential to the generation of energy for the cell. It is now widely accepted that organelles within eukaryotes were bacteria which entered the original cell, be it prokaryote or some sort of proto-eukaryote, and stayed – a process referred to as endosymbiosis. Prokaryotes reproduce by a process of mitosis, duplication and division, after which each “child” organism is essentially a clone of the “parent”. Eukaryotes also duplicate themselves by mitosis, but they reproduce by meiosis, a process in which a selection of genes from each parent is combined with a selection from the other. [ref]The subject of reproduction through mitosis and meiosis will be discussed in more detail in the chapter on biochemistry and cellular biology. [/ref] This method of reproduction leads more rapidly to greater diversity of genes and, so, to the formation of new species. Only eukaryotes form multicellular organisms, a necessity for more advanced forms of life. 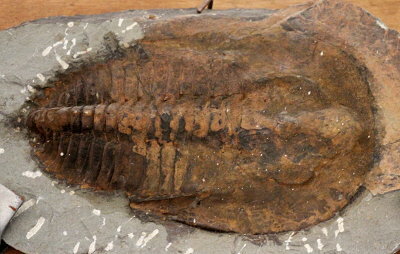 Fossils usually only show the harder body parts of the fossilized organisms. But from the end of the Proterozoic, around 575-542 Mya[ref]The Vendian Period of the Proterozoic Era ran between 600 and 542 Mya. [/ref], fossils were discovered which also showed the softer body parts of strange and complex organisms. Named after the Ediacaran Valley in Australia where they were first discovered, they have since been found around the world in places such as Charnwood Forest, England, or Mistaken Point, Newfoundland. Around the beginning of the Paleozoic, as tectonic plates continued moving, Rodinia broke up into Gondwana and Laurentia. About 300 Mya, the sea between them shrank and they collided to form the supercontinent, Pangea[ref]Also spelled Pangaea.[/ref]. The superocean surrounding it is called Panthalassa. For once, a supercontinent was not located right at the equator; about ¾ of Pangea was in the southern hemisphere. Probably the most famous of the Cambrian fossils are those of the Burgess Shale field of about 505 Mya (Middle Cambrian), now in Canada. 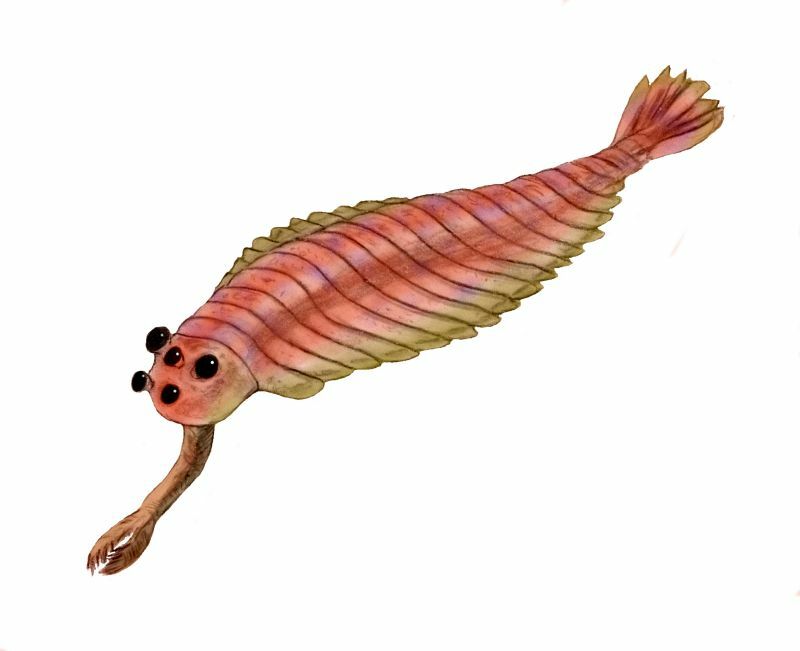 [ref]Burgess shale fossils and their importance. http://www.burgess-shale.bc.ca/discover-burgess-shale/burgess-shale-fossils-and-their-importance[/ref] Some of them were pretty strange and are still the subject of study and hypotheses. Sponges, considered to be the most primitive animals alive today, had appeared in the late Vendian[ref]Or Ediacaran, about 650-450 Mya. [/ref] (end of the Protozoic). 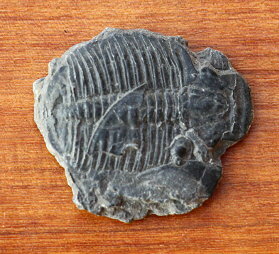 Trilobites, a type of arthropod[ref]An arthropod is “…an invertebrate animal having an exoskeleton (external skeleton), a segmented body, and paired jointed appendages.” Wikipedia, https://en.wikipedia.org/wiki/Arthropod. [/ref], became a dominant form of marine life. They existed in thousands of different species on every continent for some 270 million years, so long that they have been referred to as the “mascots” of the Paleozoic. They ranged in size from several millimeters to over 50 centimeters. Some had eyes with many crystalline lenses, like fly eyes. 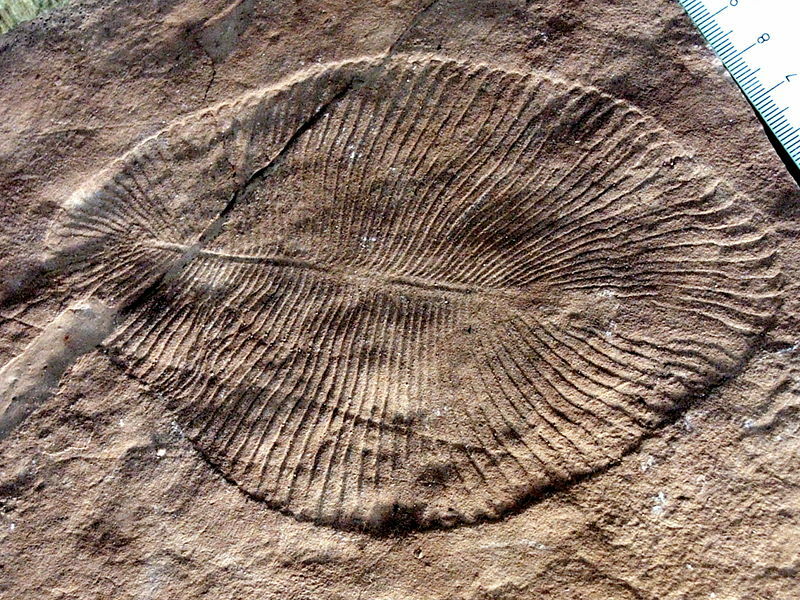 Over time thousands of species of trilobites existed – in shallow seas on every continent. 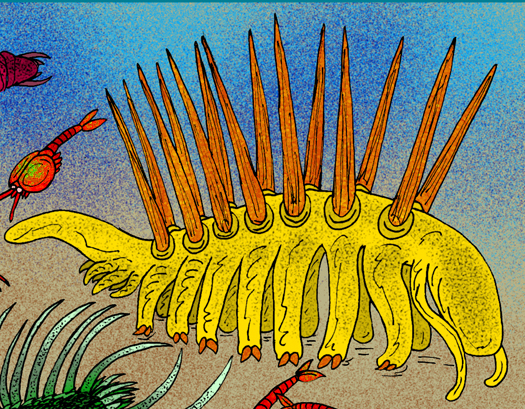 Near the end of the Cambrian, there were three trilobite mass extinctions due to climate change and other factors (continental movements, evolution of predators). But trilobites survived. A very important evolutionary step was the development of the amniotic egg. This protected the young inside a protective cover and provided the nutrients that young amphibians could only get from water. 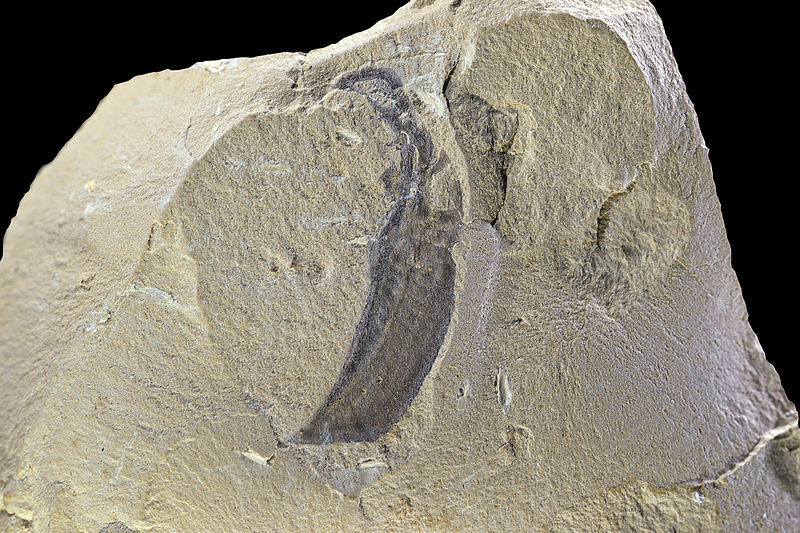 This development contributed greatly to the evolution of amniotes (the first of which resembled small lizards), which now could leave the water completely. These animals split into two groups, synapsids (early mammals) and sauropsids (early reptiles). [ref]There is some disagreement here. Some authors refer to the first amniotes as reptiles and later speak of “mammal-like” reptiles. or “stem mammals”. It seems easier to speak of amniotes which were the ancestors of both mammals and reptiles. [/ref] The first reptiles date from the mid-Carboniferous, during which life on land and sea reached a new peak of development and diversity. Near the end of the Carboniferous, as Gondwana (the southern continent comprising today’s South Africa, South America, Antarctica, Australia and India) approached the poles, as seen in a preceding figure, there was a period of glaciation which lasted into the Permian. Remaining glacial features on these continents provide evidence for plate tectonics, as some of these continents now occupy much warmer latitudes[ref]Benton, 90[/ref]. 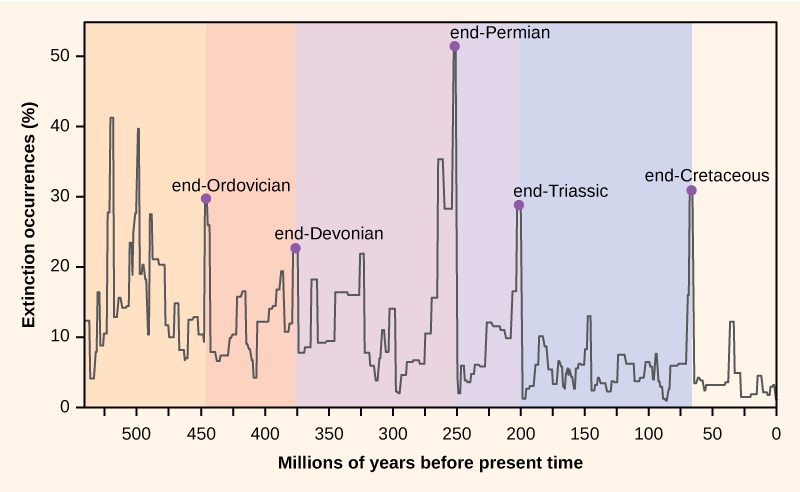 The Paleozoic Era ended with the greatest of all the mass extinctions, the end-Permian extinction (or Permian-Triassic extinction), sometimes referred to as the Great Dying. It is estimated that 96% of sea and 70% of land species disappeared[ref]McDougall (1998), 321.[/ref]. The date of the extinction marks the end of the Paleozoic and the beginning of the Mesozoic Era, largely accepted as 251 Mya. A recent study[ref]“Ancient whodunit may be solved: The microbes did it!|” March 2014: MIT News, newsoffice.mit.edu/2014/ancient-whodunit-may-be-solved-microbes-did-it. [/ref] indicates that the eruptions in the Siberian Traps increased the amount of nickel in the Earth’s crust and this was a nutrient for a microbe, a methane-producing archaea called Methanosarcina, which had undergone a genetic change at about that time. It is suggested (claimed, even) that the microbe emitted vast amounts of methane into the atmosphere and so changed the climate. The Siberian flood basalts, or Siberian traps[ref]“Traps” from the swedish word for staircase, “trappa”. [/ref], occurred around 252 Mya – at the time of the end-Permian extinction. So the end-Permian extinction was probably initiated by volcanic eruptions in Siberia which increased the amount of methane and CO2 in the atmosphere, disrupting the carbon cycle and bringing about a “runaway greenhouse phenomenon” [ref]Benton, p. 118.[/ref]. This in turn would have caused oceans to release dissolved oxygen. It could have caused acid rain which killed land plants vital to survival of animals. The CO2 would have been absorbed by the oceans and led to their acidification, wiping out many marine organisms.